DULLES, Va.Dec. 6, 2017-- Orbital ATK (NYSE: OA), a global leader in aerospace and defense technologies, today announced that its Cygnus spacecraft, following a highly successful stay as a part of the International Space Station, has departed from the station to begin the next phase of its mission. The S.S. Gene Cernan is now set to deploy a record number of cubesats in orbit before reentry into the Earth s atmosphere. The OA-8 mission marks the fourth time that Cygnus has been used for NanoRacks cubesat deployments during its secondary payload mission phase. Cygnus departed from the International Space Station at 8:11 a.m. EST, one day after being unberthed by the station s robotic arm and conducting a test for NASA while still grappled. The spacecraft spent 22 days at the orbiting laboratory before leaving with approximately 6,400 pounds (2,900 kilograms) of items for disposal, marking the largest amount of material removed by Cygnus during its cargo resupply missions. During this period, Cygnus also acted as an extension of the space station for the first time by successfully supporting science experiments inside the cargo module while docked to the laboratory. Our stay at the International Space Station proved to be extremely productive and further demonstrated expanded capabilities for Cygnus beyond our core functions of delivery and disposal, said Frank Culbertson, President of Orbital ATK s Space Systems Group. Cygnus performed flawlessly as an in-orbit science platform while attached to the space station for the first time. Our work continues as we now begin the next phase of the mission to deploy a record number of cubesats. The OA-8 mission began on November 12 when Cygnus launched aboard an Orbital ATK Antares rocket at NASA s Wallops Flight Facility. 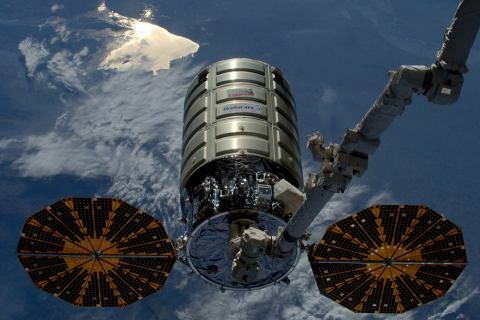 Upon arrival at the orbiting laboratory, Cygnus delivered approximately 7,400 pounds (3,350 kilograms) of cargo and science experiments to the astronauts, marking Orbital ATK s eighth operational mission to the International Space Station. Now, the S.S. Gene Cernan will use a NanoRacks cubesat deployer to release a record 14 cubesats into orbit. Eight of the cubesats will join Spire Global s commercial weather satellite constellation for global ship tracking. The NanoRacks manifest also includes cubesats from NASA s Jet Propulsion Lab. Additionally, AeroCube B/C consists of two water-based propulsion satellites assembled by the Aerospace Corp. for NASA s Optical Communications and Sensor Demonstration, or OCSD, marking the first propulsive satellites to deploy from the Cygnus spacecraft. The OA-8 mission is expected to end on December 18 when Cygnus will execute a safe, destructive reentry into Earth s atmosphere over the Pacific Ocean. Stay informed with real-time updates on the science experiments aboard Cygnus through Orbital ATK s Twitter account: https://twitter.com/OrbitalATK.